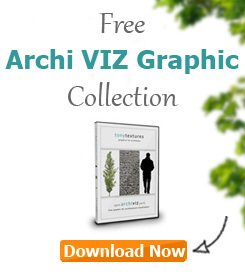 The file consists of four layers, to give you an idea how it works and motivate you to expand the file on your own. 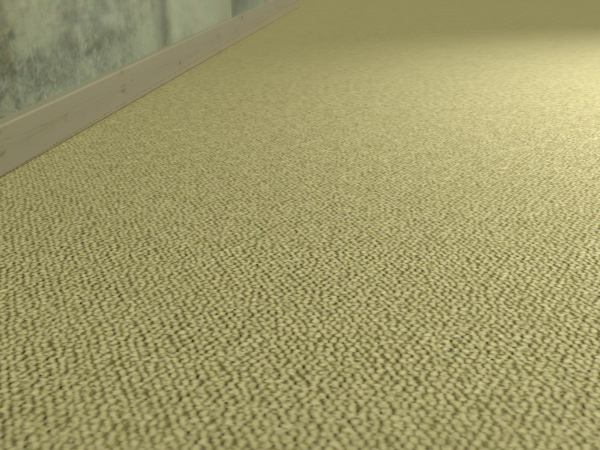 The layer at the bottom is the background texture – the basis for our carpet texture. By the way, it is already seamlessly tileable. In addition you can use the background image as a bump map in your rendering tool, because it is already a greyscale image. 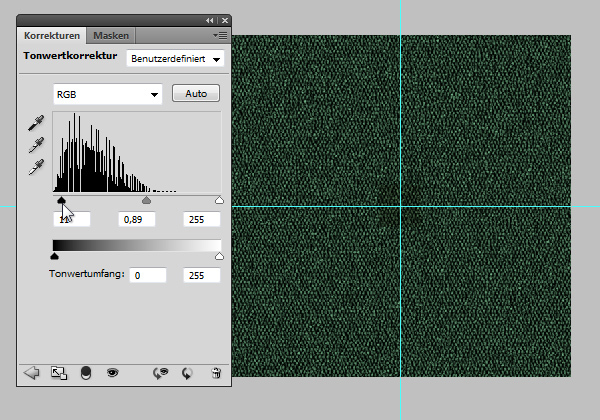 Therefore the layer is named “Bump”. With the help of the two Adjustment Layers above the “Bump” layer you can easily edit the color and the brightness of the basic texture without making any changes to the original image. 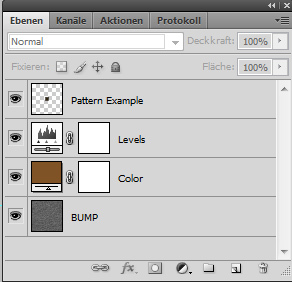 Finally there is a layer called “Pattern Example” above all to give you an idea how to combine your basic texture with a pattern of your choice. 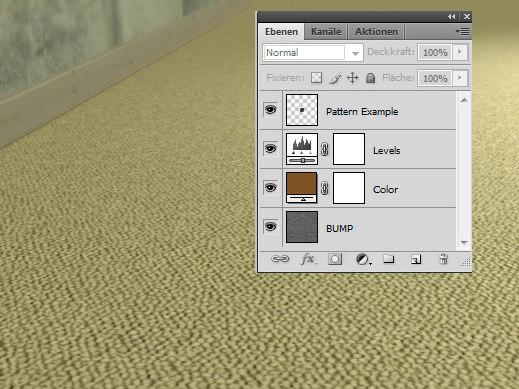 Like mentioned before you can use the Adjustment Layers to edit the color and brightness of your texture. 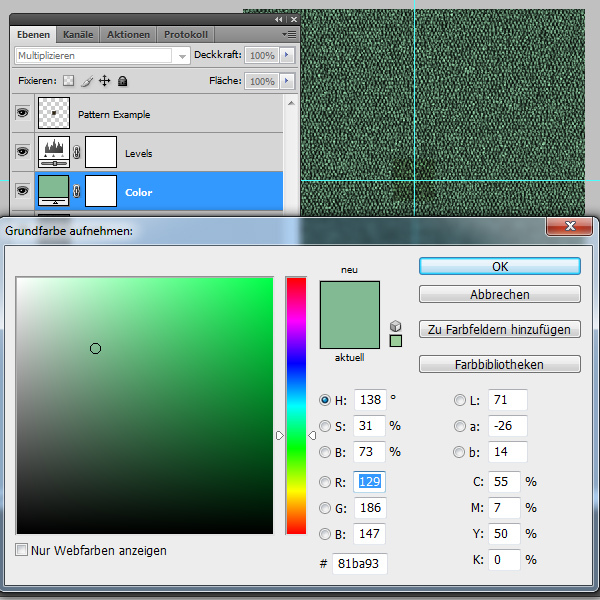 Therefore you double click on the color icon of the layer and select any color. The same way the brightness of your texture can be changed. Therefore double click on the icon of the Levels Adjustment Layer. Drag the small black, grey and white triangles to one side and you will directly see the result. Finally you find the layer “Pattern Example”. It shows you how to combine any structure or pattern with the basic texture. In this case it is a darker rectangle which creats a regular pattern at the end. The blending mode of the layer is set to Overlay and the opacity is reduced to 35% to guarantee a smooth combination of both textures. Create any other pattern to create endless variations the same way. 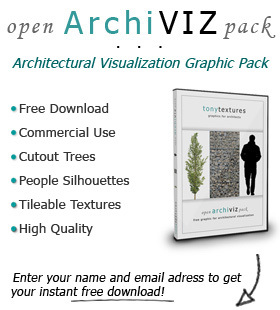 This Photoshop file should animate you to play arould with the different methods and make you creating your own unique textures.